How Feasible is Beijing’s Ambition to Create a Global Base Network? After opening its first official fully fledged foreign base in Djibouti in July 2017, Beijing has continued developing it. According to the information provided by Jane’s Defence Weekly, the Chinese are quickly building large quays and moorings for battleships and secret underground warehouses for fuel, possibly ammunition, etc. This put an end to the long discussion in Beijing on whether or not China should have bases abroad, which was held tumultuously and with cunning. 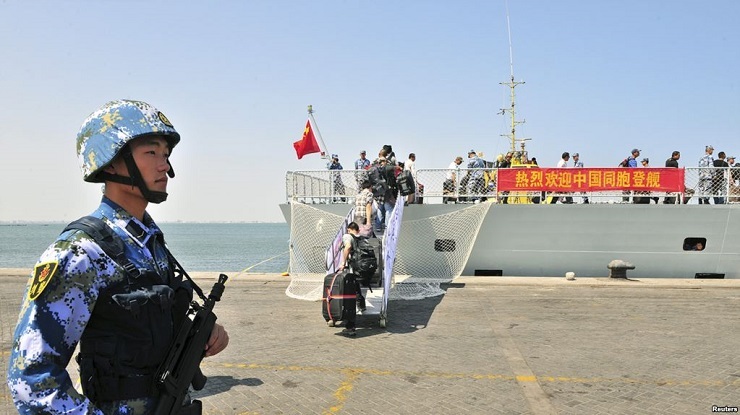 For quite a while, military experts from many countries have ignored the Chinese assurances that their strongholds and their first Djibouti base would be used for peace purposes, such as defence or humanitarian activities. And there are grounds for that. Since late 2017 – early 2018, Chinese officials have openly expressed their willingness to ensure the security of the One Belt, One Road Initiative (OBOR). And a recent independent study in London showed that China had begun to speak more often (although, on an individual basis for the time being) of its interest not only in the commercial advantages of the project, but also in its strategic and geopolitical aspects, which forces Beijing to search for new forward deployment locations. Meanwhile, it is not at all the only reason for continuing the search. Alongside the battleships, hydrographic and oceanographic vessels and reconnaissance ships appear in the Indian Ocean water area in order to explore the ocean bottom, which is significant for improving the maintenance and further deployment of submarines. This exploration has to do with the implementation of the large ocean monitoring system made public in Beijing in early 2018. It is based on several elements: a network of platforms and floats, surface ships, submarines and satellites. The first element. It comprises 100 – 150 (with more on the way) floats in the Asia Pacific and in the Indian Ocean in order to carry out exploration work and improve the submarine operation in the ocean. This will enable China to build an ocean surveillance system, especially along the Maritime Silk Route and catch up (and even outstrip in certain aspects) the US, France, Japan, etc. Apparently, land bases continue to play the role of a crucial strategic link in this system. Given that fact, China remembered Gwadar, which may become the next Chinese naval base in the Greater Indian Ocean (GIO). Over the next 5 years, Beijing is going to build quarters for 500,000 Chinese soldiers and a large contingent of the Chinese Navy. This ‘population of strangers’ will exceed the indigenous population and make Gwadar a real Chinatown, a Chinese colony in the GIO. According to the Pakistani officers, Gwadar is to see the deployment of a squadron of several Chinese and Pakistani battleships for securing both the port and the China – Pakistan corridor that is currently being built. A naval base is going to appear 60 km to the west from Gwadar, in Jiwani, where a small Pakistani naval base already exists. The location choice was not random, since it is closer to the Strait of Hormuz, which is critical should any crisis break out in the Persian Gulf or around it. But searching for new bases is far from over. For instance, Tanzania where the Chinese managed to take control of the recently built port in Bagamoyo 50 km to the north of Dar es Salaam. After establishing the control of the port, other demands in the interest of Beijing may follow. In 2018, speculation regarding building a base in the small island state of Vanuatu lasted for several months. Beijing also has a great choice among the economically dependent small countries with using debt-trap diplomacy, when the local authorities deep in debt to China become more tractable concerning providing their territories for the Chinese strongholds. The example of Sri Lanka is rather indicative; it owed $ 1.4 billion to China for various projects (including the Maritime Silk Route) and had to lease the Hambantota port to China for 99 years, de facto giving it an opportunity to exert some more pressure on the local authorities in the future allowing China to use the port for military purposes. One could consider the situation on the Maldives or in Myanmar in the same way. China is actively building the military base for the Afghan armed forces in the Badakhshan Province. China will provide it with funding, weapons, ammunition, soldier uniforms, military equipment, etc for its efficient operation. The Chinese participation in the construction work in such a difficult region is aimed at preventing terrorists from the neighbouring countries from crossing to the restless Xinjiang Uyghur Autonomous Region, strengthening its influence, defending its trade and economic interests, etc. One is led to believe that Antarctica found its way to the list of locations for base deployment not by pure chance, since China already has 3 research bases there. Now, the construction of the 4th base, the Taishan Station, began here, and there is an ongoing search for the future location of the 5th base, where Chinese scientists would not only study the climate change and the atmosphere, but also explore the ocean bottom using cutting-edge underwater equipment, which will apparently be in demand for the aforementioned military plans for creating an ocean monitoring system. In March 2018, Patagonia, the remote province of Argentina, launched a station with a huge antenna and other high-tech equipment for controlling satellites and circumterrestrial space, in particular, the Chinese satellite flying to the Moon. It is de facto one of the examples of the third element of the Beijing global system described above. And even though the Argentinian authorities tried to convince the public that Beijing would not use it for military purposes, experts are convinced that the high technologies deployed in the station have great opportunities for military and strategic use. And the Argentinian population residing in the vicinity of the station consider it a real military base. Frank A. Rose, the US Assistant Secretary of State for Arms Control, Verification, and Compliance (of the Barack Obama Administration) stated in July 2018 that this base could expand the Chinese opportunities for collecting classified information in the Western Hemisphere. And China is not the only country that is considering space as a future space war arena. It is not by pure chance that the US President Donald Trump announced the establishment of the 6th military branch dealing with space. And although China is taking a great effort to create its own global network of bases of various types and objectives, it still has a long way to go before it catches up with the US that has over 800 bases spread around the globe. And the global community has to watch closely where and for what reasons new US, Chinese or any other state’s bases appear that represent a tangible threat to the peace and stability in the world. Nina Lebedeva, a leading researcher at the Center for Indian Studies at Institute of Oriental Studies of the Russian Academy of Sciences, exclusively for the online magazine “New Eastern Outlook“.